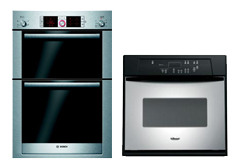 According to the existing user reviews and rating the following Built-In Oven models are top selling. To determine the top selling Oven we looked at; Quality of available features, Durability, Price, Cleaning ease, Functionality, Styling. 1. Maytag MMW7530WDS 30 inch Microwave Combo Built-in Wall Oven with 4.1 cu. ft. Oven Capacity, 1.4 cu. ft. Microwave Capacity, Closed-Door Broiling, Precision Cooking System. 2. Bosch HBL8650UC 30 inch Double Electric Wall Oven with Genuine European Convection in Both Ovens, 15 Cooking Modes, Glass Touch Controls, Meat Probe and Telescopic Rack. 3. Frigidaire FFET2725LB Black 27 inch Double Electric Wall Oven with Power Clean, Vari-Broil System and Ready-Select Controls & 3.5 cu. ft. Upper/Lower Oven Capacity. 4. Whirlpool RBD307PVS 30 inch Double Electric Wall Oven with 4.1 cu. ft. Capacity per Oven, TimeSavor Convection System, Delay Bake and Glass Touch Electronic Controls.